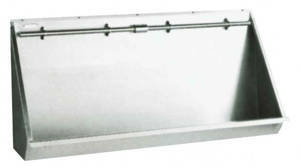 Collective wall-mounted urinal made of stainless steel AISI 304 (VELTIA 13003.12.S). Suitable for discharge system manual or electronic actuation. Wall-mounted collective urinal in stainless steel AISI 304 (VELTIA 13003.18.S). Suitable for manual or electronic discharge system. Wall-mounted collective urinal in stainless steel AISI 304 (VELTIA 13003.24.S).